In the evaluation of a patient who experiences dizziness, the examiner's initial efforts must be directed at determining the exact nature of the patient's symptoms because the pathophysiology determines the patient's sensations. Precisely understanding the symptoms determines the workup. For example, in a patient with syncope or presyncope, the cause of the sensation is probably cardiovascular and not inner ear. In contrast, in a patient with a sensation of spinning or whirling, the pathology probably involves the inner ear or vestibular nerve on one side, although insults to the cerebellum and brainstem may also produce true vertigo. Therefore, the cause in a patient with true vertigo cannot be assumed to be peripheral. Although close questioning and careful examination usually reveal important differences, conditions such as multiple sclerosis, migraine equivalent, and vertebrobasilar transient ischemic episodes may simulate peripheral vestibulopathy. Vertigo, the hallmark of inner ear disease, is defined as the illusion of movement of either one's self or one's environment. Details on assessing the patient's current and medical history are presented in the Technique section below. The semicircular canals (see the image below) are arranged as a set of 3 mutually orthogonal sensors; that is, each canal is at a right angle to the other 2. This is similar to the way 3 sides of a box meet at each corner and are at a right angle to one another. Furthermore, each canal is maximally sensitive to rotations that lie in the plane of the canal. The result of this arrangement is that 3 canals can uniquely specify the direction and amplitude of any arbitrary head rotation. The canals are organized into functional pairs wherein both members of the pair lie in the same plane. Any rotation in that plane is excitatory to one of the members of the pair and inhibitory to the other. For more information about the relevant anatomy, see Vestibular System Anatomy, Visual System Anatomy, Extraocular Muscle Actions, Extraocular Muscle Anatomy, and Inner Ear Anatomy. Perform a complete examination of pertinent systems, such as the cardiovascular and neurologic systems (especially cranial nerves), before proceeding to specific office tests of the vestibular system. For example, if a patient experiences presyncope, perform auscultation of the heart and cervical vessels, and determine orthostatic blood pressure and pulse. Examine the ears for a retracted or perforated tympanic membrane or cholesteatoma. Assess hearing in both ears. Balance involves the overlapping function of several systems, namely, the visual system, the proprioceptive system, and the vestibular system. Together, these systems maintain equilibrium. Although many of the office-based tests described below incorporate this triad of sensory systems, most tests concern the vestibular system. The primary goal of the vestibular system is to limit the slippage of images on the retina during head movement. Slippage of images greater than 2-3° per second blurs visual acuity. The 3 systems that are involved in limiting retinal slip are (1) the smooth-pursuit system, (2) the optokinetic system (which work best at relatively low head velocities), and (3) the vestibulo-ocular reflex (VOR) system. In the VOR system, the semicircular canals are angular accelerometers, and the otolithic organs are linear accelerometers. Because most human movements are brisk (0.6-8.2 Hz, or < 90° per second during walking to < 170° per second during running), the human vestibular system has evolved into a transducer of rapid head movement, an observation that is reflected in many of the tests. For patients whose symptoms are episodic, physical examination findings may be normal between episodes. Furthermore, because the patient often can suppress nystagmus caused by a peripheral vestibulopathy, many of the vestibulo-oculomotor tests in the office examination are performed with +20 lenses (ie, cataract glasses), which prevent the patient from focusing on objects in the visual surround. Gait test: Determine whether the patient staggers or consistently leans to 1 side or the other. Assess for an internuclear ophthalmoplegia and gaze-dependent nystagmus. Nystagmus of peripheral (ie, labyrinthine) origin typically is unidirectional. Looking in the direction of the fast phase of nystagmus and preventing visual fixation with +20 lenses exaggerate the nystagmus. Nystagmus of brainstem or cerebellar (ie, central) origin may be bidirectional and have more than one direction, eg, torsional plus horizontal movement. Pure vertical nystagmus almost always is a sign of brainstem disease and not a labyrinthine disorder. The Romberg test originally was described as a test for tabes dorsalis. The sharpened Romberg test is having the patient stand heel to toe with 1 foot in front of the other; this test is required to detect abnormalities in younger patients. The patient is asked to step in place for 20-30 seconds. Rotation of the patient may indicate a unilateral loss of vestibular tone. The Dix-Hallpike maneuver is one of the most important tests for patients who experience true vertigo. This test involves having the patient lie back suddenly with the head turned to one side. The test results are considered abnormal if the patient reports vertigo and exhibits a characteristic torsional (ie, rotary) nystagmus that starts a few seconds after the patient lies back (latency), lasts 40-60 seconds, reverses when the patient sits up, and fatigues with repetition (see Medscape Reference article Benign Paroxysmal Positional Vertigo). The examiner vigorously shakes (approximately 1 Hz) the patient's head in the horizontal plane from side to side for 10-15 seconds. The patient is wearing +20 lenses to inhibit visual fixation. After the shaking is stopped, the eyes are observed for nystagmus. This test can reveal latent nystagmus and indicate which labyrinth is malfunctioning. By convention, the fast phase of nystagmus is the terminology used to describe nystagmus. In this test, the fast phase of nystagmus is directed toward the normal (or better-performing) labyrinth. The patient is asked to gaze steadily at a target in the room. The examiner briskly moves the patient's head from one side to the other while observing eye position. A normal result is obtained when the patient's eyes remain fixed on the target. When the eyes make a compensatory movement after the head is stopped to reacquire the target (a refixation saccade), the test results are abnormal. This test can indicate if the output of one or both labyrinths is depressed. Before and during vigorous head shaking, the patient is asked to read the smallest visible line on the Snellen eye chart. A normal result is the ability to maintain acuity within 2 lines of the acuity at rest. Oscillopsia is the result of bilateral vestibulopathy, which most commonly is observed in ototoxicity. The fistula test is designed to elicit symptoms and signs of an abnormal connection (fistula) between the labyrinth and surrounding spaces. Fistulas may be acquired, most commonly as a result of cholesteatoma or, less commonly, as a dehiscence of bone overlying the superior semicircular canal. Iatrogenic causes include chronic ear surgery and stapes surgery. The test involves the application of pressure to the patient's ear canal and observation of eye movements with Frenzel lenses in place. Occluding the ear canal with the patient's tragus or using a Bruening otoscope can provide pressure to the ear canal. The direction of nystagmus depends on the site of the fistula, a topic that is beyond the scope of this article. Carefully examine the cranial nerves, especially cranial nerves V and VII. The following tests commonly are performed to evaluate patients with vertigo. This test has 2 parts, namely, oculomotor testing (pursuit and saccades) and caloric testing. Eye position is monitored by using electro-oculography, which relies on the dipole of the eye. In caloric testing, the ear canals are irrigated with water or air that is 7°C above or below body temperature. The goal of the test is to determine if significant asymmetry is present in the response of the labyrinths, which can indicate peripheral vestibular disease. Evidence of CNS disorders also can be identified on electronystagmography. The caloric test may be helpful in determining the side of the lesion; however, it has several significant limitations. First, the test has a relatively poor reliability; test-retest values change markedly in the same patient. Second, the test can be used to examine only a small portion of the balance system (ie, the lateral canals) through a small range of frequencies. Hence, results of the test may not be generalized to the entire labyrinthine function of the tested subject. This test involves sinusoidally rotating the subject in a darkened booth while eye position is monitored to assess the VOR. By comparing eye velocity to head velocity (ie, velocity of the chair), one can determine VOR gain. The phase lead of the response and any asymmetry in the response can also be determined. Because rotational chair testing requires expensive and cumbersome equipment, the vestibular autorotation test (VAT) has been developed to allow evaluation of the VOR. Also, commercially available rotational chairs allow testing at only modest head frequencies, typically less than 1 Hz, whereas VAT allows evaluation of the VOR at higher and more physiologically significant frequencies. The most commonly used system for VAT testing is from Western Systems Research, Inc. (Pasadena, CA). The test is performed by using a computer-generated metronome to which the patient moves his or her head for an 18-second trial period at frequencies from 2-6 Hz. Because high head frequencies are tested, smooth pursuit contributes little to the response, and the test can be conducted in a lighted room while the patient fixates on a stationary target. This test can evaluate both the vertical and horizontal VOR. The best use of the test may be in monitoring the VOR in patients who receive vestibulotoxic agents. The portability of the equipment allows bedside testing of hospitalized patients. The test/retest reliability of the test has been debated in the literature; therefore, it has not been adopted universally as a standard test of VOR function. The tests described thus far address only 1 limb of the complex sensory and motor interactions required to maintain balance. Because the maintenance of equilibrium involves contributions from the vestibular system and the visual and somatosensory systems, platform posturography was developed to assess equilibrium as a whole. The most commonly used system is the EquiTest. The patient stands on a platform, is secured in a harness, and faces a visual surround. Under the direction of the computer, the platform and visual surround can move independently or together in response to patient sway. Force plates in the platform monitor the patient's sway and center of gravity. The computer records the information for analysis and uses the information to move the surround during parts of the test. The test protocol comprises 2 parts, namely, the motor-control test and the sensory-organization test. In the motor-control test, the platform administers sudden anteroposterior and posteroanterior translations while the force plates record the patient's response to the perturbations. Three movements (small, medium, and large) are used to cause specified rotations around the ankle joint, shifting the center of gravity. In a different motor-control test, small toes-up and toes-down platform rotations are presented. During both movements, the force plates record the distribution of weight over the feet during the movement, and the latency of the patient response to platform movement is calculated. Conditions that disturb spinal reflexes increase response latency during the motor control test. Adaptation to repeated movements is also calculated. In the sensory-organization test, the platform and visual surround are manipulated to test the patient's relative reliance on VOR, visual, and proprioceptive/somatosensory systems. During the first 3 test conditions, the platform remains fixed. In the first test condition, the subject stands quietly with eyes open while the platform and visual surround remain stationary. In the second test condition, the patient stands with eyes closed. In the third condition, the visual surround moves in response to information from the force plate, ie, when the patient leans forward, the visual surround falls away from the patient proportionally (sway referencing). The effect of this condition is to remove reliable visual cues, forcing the use of the vestibular system and, more importantly, the somatosensory system. In test conditions 4, 5, and 6, the platform moves to follow the forward-backward sway of the patient. Platform movement removes reliable somatosensory cues for equilibrium. In condition 4, the visual surround remains fixed while the subject's eyes are open. In condition 5, the patient's eyes are closed. In condition 6, both the platform and visual surround are sway referenced, providing inaccurate visual and somatosensory information and forcing the reliance on vestibular inputs. Responses are documented in subjects with suspected malingering or psychiatric disorders. The ability of platform posturography to detect malingerers by their specific patterns of response is well established. A program of vestibular rehabilitation is planned, and response to treatment is monitored in patients who have a variety of equilibrium problems. Patients who may be at particular risk of falling and sustaining possible injury can be monitored. Patients who have disequilibrium because of elevated cerebrospinal fluid pressure can be monitored. Electrocochleography: Although electrocochleography is not extremely sensitive, it is highly specific for conditions related to inner ear fluid imbalance (most commonly Ménière disease). Auditory brainstem response: Testing of the auditory brainstem response (ABR) can help in the diagnosis of rare cases of microvascular compression of cranial nerve VIII in the cerebellopontine angle or root-entry zone. A test of the patient's vestibular evoked myogenic potentials (VEMPs) can help determine the neural integrity of the saccule and inferior vestibular nerve. The saccule, which has some sound sensitivity, is innervated by means of the inferior vestibular nerve. The inferior vestibular nerve has its main input to the lateral vestibular nucleus (Deiter nucleus), where the 2 main postural tracts originate. The medial vestibulospinal tract is responsible for postural control of the neck, whereas the lateral vestibulospinal tract is dedicated to the lower trunk and limbs. For the most part, sound-evoked VEMPs are considered completely unilateral. The test is performed simply by placing EMG electrodes on the anterior neck muscles including the sternocleidomastoid muscle. The patient holds their head up unsupported, using only their anterior neck muscles. The patient is instructed to tense the muscle during acoustic stimulation, and relax after the stimulation stops. Loud clicks or tone bursts (95-100 DB nHL) are repetitively presented to each ear. If the neck muscles are not activated, no VEMP is produced. This technology is currently still evolving, and its clinical utility is still being determined. The technology is currently being applied to patients with suspected Ménière disease when the diagnosis is unclear. More recently, it has been applied to patients with superior canal dehiscence and vestibular schwannomas. Recent studies have demonstrated that surface electrodes placed near the eyes can record VEMPs from the extraocular muscles (known as ocular VEMPs). More research is needed to determine the clinical value of these measurements. The most common cause of true vertigo is benign paroxysmal positional vertigo (BPPV). The classic history of an individual presenting with BPPV consists of symptoms of acute vertigo lasting less than 1 minute that occurs when the patient lies supine, sits up, rolls over in bed, or tilts his or her head backward. After the patient assumes one of these positions, vertigo and torsional nystagmus usually begin within 1-4 seconds. This latency period also applies to a reversal of nystagmus when the patient returns to the upright position. BPPV is often related to head trauma; however, it is frequently is found in older patients without a clear history of head trauma. Particles (probably dislodged otoconia) that become trapped in the posterior semicircular canal cause BPPV. Although the posterior semicircular canal is the most common site of the lesion, in rare cases patients have horizontal or superior canal variants. Although the condition may spontaneously resolve in many patients, others seek medical care for this unsettling problem. Medications, such as meclizine or benzodiazepines, are usually not helpful in the treatment of BPPV. The most effective treatment is repositioning of the canalith, which is an office-based maneuver in which the particles are shifted out of the semicircular canal and into the vestibule, where they do not cause symptoms. Intense vertigo that often begins acutely after an upper respiratory or flulike illness characterizes vestibular neuritis. Hearing is usually not affected. Severe vertigo lasts 24-48 hours and gradually subsides. After the vertigo resolves, patients may experience unsteadiness for weeks as the vestibular system gradually accommodates. Treatment is usually symptomatic after one ensures that the patient does not have a central etiology of symptoms, such as Wallenberg syndrome. Drugs such as meclizine, promethazine, or prochlorperazine are useful in suppressing vertigo and nausea and vomiting, which can be distressing. Ménière disease (or syndrome) typically manifests as a combination of 4 symptoms, namely, hearing that fluctuates in 1 ear (though Ménière disease can be bilateral), tinnitus that fluctuates in 1 ear, aural fullness, and episodes of vertigo that last for hours. However, Ménière disease often presents with just 1 or 2 symptoms of the tetrad that occur months to years before involving the entire tetrad. Low-frequency hearing loss is a typical manifestation in Ménière disease. A relative overproduction or underabsorption of endolymph is thought to cause Ménière disease. The underlying etiology is unknown. Evaluate patients with suspected Ménière disease for syphilis, because patients who have late tertiary syphilis can present with identical symptoms. A fluorescein treponema antibody (FTA) test can be used for this purpose. Ménière disease initially is treated with sodium restriction and possibly diuresis. Vestibular suppressants are useful during episodes. A combination of a diuretic and a vestibular suppressant controls episodes of vertigo in 60-80% of patients. Patients whose symptoms fail to respond to conservative treatment and who continue to have episodes of vertigo may benefit from a variety of treatments. Endolymphatic sac decompression (ESD) can be performed. This outpatient procedure is the most commonly performed surgery for Ménière disease. Through the mastoid, the endolymphatic sac is exposed and freed of surrounding bone. Some surgeons insert a shunt to drain endolymph from the sac, though the benefit of this maneuver compared with simple decompression of the sac is not clear. With ESD, the rate of substantial control of symptoms is approximately 80% while it spares the patient's hearing. Sectioning of the vestibular nerve. This procedure is performed through a posterior or middle fossa craniotomy. The vestibular division of cranial nerve VIII is cut, sparing the auditory division. The benefit of the operation is preservation of hearing in all but a few patients, with a >90% success rate in terminating episodes of vertigo. 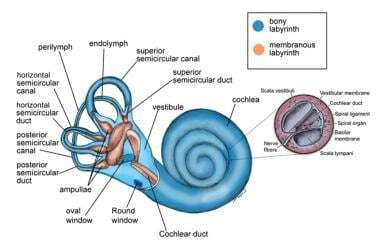 Labyrinthectomy can be performed in patients with unilateral symptoms who have poor hearing that cannot be improved by a hearing aid. This procedure remains the criterion standard in the treatment of unilateral Ménière disease and the highest success rate in terminating episodes of vertigo. However, all of the remaining hearing in the treated ear is lost. Superior canal dehiscence syndrome is an entity in which the superior semicircular canal has become dehiscent in the floor of the middle fossa. Patients tend to report that loud sounds or pressure changes exacerbate their vertiginous symptoms. Exclude central causes in patients with vertigo. Etiologies such as multiple sclerosis, Wallenberg lateral medullary syndrome, cerebellar ischemia or infarction, benign or malignant CNS or posterior fossa neoplasms, or Arnold-Chiari malformation may cause patients to present with vertigo and signs of vestibular disturbance. The images below depict MRI evidence of these etiologies. 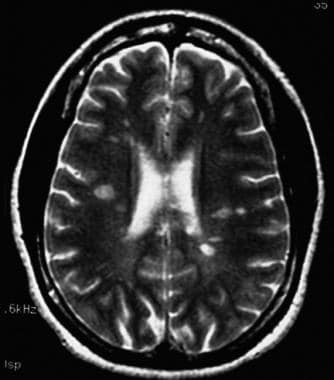 MRI of a 26-year-old woman with progressive disequilibrium and bidirectional horizontal nystagmus shows the periventricular areas of demyelination that are characteristic of multiple sclerosis. MRI of a 56-year-old woman with right cerebellar ischemia. Her history included brief episodes of vertigo and a sensation of turning to the right. Her initial MRI was negative. The brief episodes were followed by prolonged episodes of vertigo, nausea and vomiting, and truncal ataxia, which prompted a second MRI study. MRI of a 48-year-old woman with progressive unsteadiness, projectile vomiting, and headache. She was referred for an evaluation of vertigo. 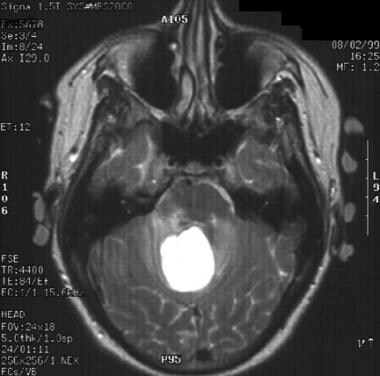 Pathology proved the posterior fossa mass to be a medulloblastoma. 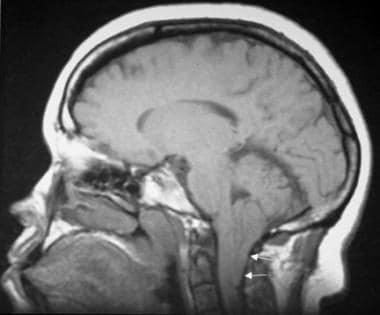 MRI of a 26-year-old woman with unsteadiness and vertical nystagmus. Arrow points to an Arnold-Chiari malformation. In almost every case, careful neurologic examination and examination of the peripheral vestibular system reveal either CNS abnormalities or other cranial nerve abnormalities. What are the approach considerations in the evaluation of dizziness? What is the relevant anatomy in a dizziness evaluation? How is a patient history conducted in a dizziness evaluation? What medical history is relevant in a dizziness evaluation? How is an initial exam conducted in a dizziness evaluation? How is the vestibular system examined in a dizziness evaluation? How is the gait test used in a dizziness evaluation? How is an oculomotor exam used in a dizziness evaluation? How is the station (Romberg) test conducted in a dizziness evaluation? How is the Fukuda test conducted in a dizziness evaluation? How is the Dix-Hallpike test conducted in a dizziness evaluation? How is the head-shake test performed in a dizziness evaluation? How is the head-thrust test performed in a dizziness evaluation? How is the oscillopsia test performed in a dizziness evaluation? How is the fistula test performed in a dizziness evaluation? How is electronystagmography with caloric testing performed in a dizziness evaluation? How is the rotational chair test performed in a dizziness evaluation? How is the vestibular autorotation test performed in a dizziness evaluation? How is the computerized platform posturography test performed in a dizziness evaluation? What is the role of the electrocochleography test in a dizziness evaluation? What is the role of the auditory brainstem response test in a dizziness evaluation? How is the vestibular evoked myogenic potentials test (VEMPs) performed in a dizziness evaluation? What is the pathology and treatment of benign paroxysmal positional vertigo/dizziness? What is the pathology and treatment of vestibular neuritis/dizziness? What is the pathology and treatment of Ménière disease identified in a dizziness evaluation? What is the pathology and treatment of superior canal dehiscence? How are central causes of dizziness identified in an evaluation? Rosengren SM, Welgampola MS, Colebatch JG. Vestibular evoked myogenic potentials: past, present and future. Clin Neurophysiol. 2010 May. 121(5):636-51. [Medline]. Helling K, Schonfeld U, Clarke AH. Treatment of Ménière's disease by low-dosage intratympanic gentamicin application: effect on otolith function. Laryngoscope. 2007 Dec. 117(12):2244-50. [Medline]. Minor LB. 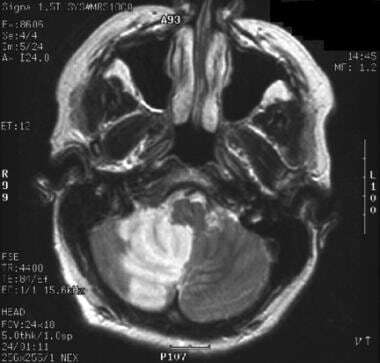 Superior canal dehiscence syndrome. Am J Otol. 2000 Jan. 21(1):9-19. [Medline]. Barber HO, Nedzelski JM, Schessel DA. Meniere disease: diagnosis and management. Sharpe JA, Barber HO, eds. The Vestibulo-Ocular Reflex and Vertigo. New York, NY: Raven; 1993. 375-84. Brantberg K, Mathiesen T. Preservation of tap vestibular evoked myogenic potentials despite resection of the inferior vestibular nerve. J Vestib Res. 2004. 14(4):347-51. [Medline]. Hain TC, Fetter M, Zee DS. Head-shaking nystagmus in patients with unilateral peripheral vestibular lesions. Am J Otolaryngol. 1987 Jan-Feb. 8(1):36-47. [Medline]. Halmagyi GM, Curthoys IS. A clinical sign of canal paresis. Arch Neurol. 1988 Jul. 45(7):737-9. [Medline]. Kessler P, Zarandy MM, Hajioff D, Tomlinson D, Ranalli P, Rutka J. The clinical utility of search coil horizontal vestibulo-ocular reflex testing. Acta Otolaryngol. 2008 Jan. 128(1):29-37. [Medline]. LaRouere MJ, Seidman MD, Kartush JM. Medical and surgical treatment of vertigo. Jacobson GP, Newman CW, Kartush JM, eds. Handbook of Balance Function Testing. St. Louis, MO: Mosby-Year Book; 1993. 337-57. Modugno G, Brandolini C, Savastio G, Ceroni AR, Pirodda A. Superior semicircular canal dehiscence: a series of 13 cases. ORL J Otorhinolaryngol Relat Spec. 2005. 67(3):180-4. [Medline]. Parnes LS. Benign paroxysmal positional vertigo: Diagnosis and treatment. Sharpe JA, Barber HO, eds. The Vestibulo-Ocular Reflex and Vertigo. New York, NY: Raven; 1993. 347-54. Rauch SD, Silveira MB, Zhou G, et al. Vestibular evoked myogenic potentials versus vestibular test battery in patients with Meniere's disease. Otol Neurotol. 2004 Nov. 25(6):981-6. [Medline]. Sharpe JA, Johnston JL. The vestibulo-ocular reflex: Clinical, anatomic, and physiologic correlates. Sharpe JA, Barber HO, eds. The Vestibulo-Ocular Reflex and Vertigo. New York, NY: Raven; 1993. 15-40.